This product goes along with the Holidays Around the World Mini Books! 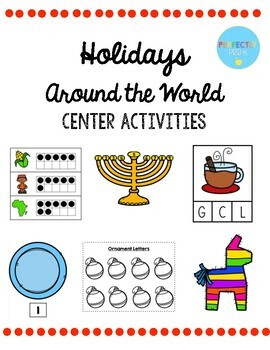 After reading about the different December holidays, students can complete themed math and literacy centers! Help get ready for Santa’s arrival! Laminate each page and cut out the cookie pieces. 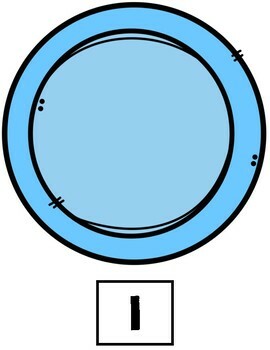 Have students count out the correct number of cookies for each plate. You can also add velcro pieces to ensure that they stick. For added variation, cut out the plates and have students sort the cookies. 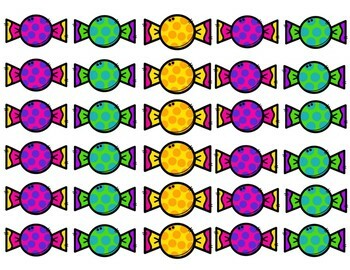 Laminate and cut out the piñata and candy pieces. Attach the piñata to a tissue box. Students roll a dice (or two for differentiation) and put that number “in” the piñata. Continue until all the candy pieces are gone and the piñata is full! Get some writing practice and letter identification skills in during winter celebrations! 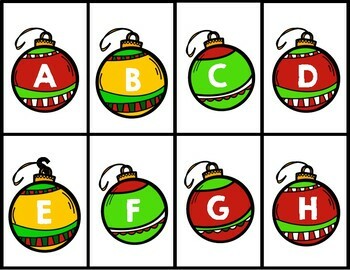 Laminate and cut the letter ornament cards — uppercase or lowercase or both, you pick! — and have students choose one at a time and write them on the recording sheet. Add some festive flair by putting the cards in a bin of tinsel! Its time to put the candles in the menorah! Students can match the number 1-9, put them in order, or match numbers to dots. Explore Santa Lucia traditions by sounding out items typically found during celebrations and identifying the beginning sounds! Use a clothespin or counter to mark the correct letter. Students explore the room looking for cards — when they find them, they count the number of dots in the tens frame and record number in the corresponding box featuring a Kwanzaa image.